11x14 giclée print on textured watercolor paper. If you live in L.A. or Oregon and want to arrange a pickup, write to me at hello@margaret-gallagher.com. 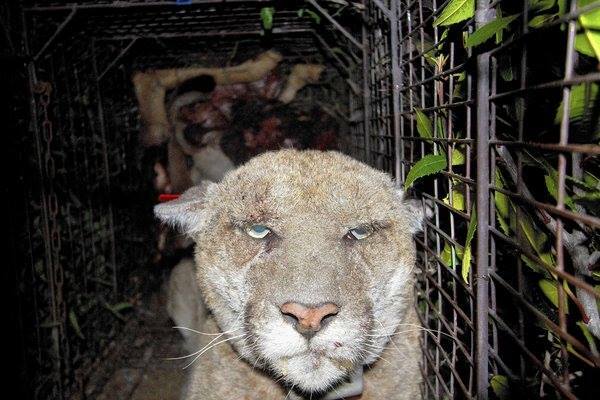 There are many iconic images of P22, Hollywood’s locally (in)famous mountain lion, but my favorite is this photo snapped of him by a wildlife camera as he was sick with a case of the mange. He looks like he has just come home from a night of partying, or woke up in a gutter wondering what he took the night before. It’s a hilarious photograph, but like many things about P22, it has a disturbing element that highlights how complicated the coexistence of humans and animals is. Wildlife experts think P22 fell sick after eating an animal with rat poison in its body - meaning, as someone tried to deal with an infestation of rats (a species introduced by humans all over the world), they set out poison that then worked its way up the food chain until it poisoned the area’s top predator. This illustration portrays another moment in the string of incidents that put P22 into the public eye. In March of 2016, a koala named Killarney was mauled to death overnight in the L.A. Zoo, and P22 was named as the culprit. Distraught zookeepers mourned Killarney’s death, while local politicians debated over whether or not it was a good idea to relocate the mountain lion. My biggest question: how did the koala taste to P22? It is a strange situation of one well-used cultural trope (the noble and magestic wild animal) crashing headlong into another one (the zoo animal, representing a host of issues ranging from our desire for the preservation of species to animal-rights advocacy). It is easy to compare P22’s exploits and fame to that of any other misbehaving Hollywood party boy or actor. Like a paparazzi photographer, the wildlife cameras spread throughout Griffith Park capture candid shots of him as he wanders through the night. P22 is mostly celebrated, and held up as a posterchild for the importance and beauty of biodiversity in our urban centers. He truly acts on his own wild imperative - he hunts when he is hungry, he hides when he is afraid, he searches (vainly) for a mate when he gets lonely. Yet everything he does will quickly be molded into the compelling role that city-dwellers have created for him.